^ a b c "Ukraine: Speaker Oleksandr Turchynov named interim president". BBC News. 23 February 2014. Archived from the original on 23 February 2014. ^ "Первый день после победы революции". Grani.ru. 23 February 2014. Archived from the original on 16 March 2014. Retrieved 12 March 2014. ^ "The uprising in Kiev has apparently reached its conclusion". Geopolitical Weekly. Stratfor. Archived from the original on 25 February 2014. Retrieved 12 March 2014. ^ a b На отмену закона о региональных языках на Украине наложат вето [The abolition of the law on regional languages in Ukraine veto]. Lenta (in Russian). Russia. 1 March 2014. Archived from the original on 1 March 2014. ^ "Makhnitsky: Some 50 people to be charged with organizing killings of Ukrainians". Kyiv Post. 24 February 2014. Archived from the original on 1 March 2014. Retrieved 24 February 2014. ^ "Ukraine crisis: Lenin statues toppled in protest". BBC News. 22 February 2014. Archived from the original on 2 June 2014. Retrieved 19 May 2014. ^ a b No Berkut troops among ‘Maidan snipers’ – Ukrainian special forces veteran. RT. 3 April 2014. Retrieved 18 April 2014. ^ К сегодняшнему расстрелу митингующих может иметь отношение подразделение "Альфа" СБУ [By now in massacre of protesters may have relation unit "Alpha" SBU]. Zerkalo Nedeli (in Russian). Archived from the original on 20 February 2014. Retrieved 20 February 2014. ^ "EuroMaidan rallies in Ukraine – Dec. 16". Kyiv Post. 15 December 2013. Retrieved 15 December 2013. ^ "The Council of Maidan Self-Defense Organizes "United Revolutionary Army" throughout Ukraine | Euromaidan PR". Euromaidanpr.wordpress.com. 8 February 2014. Retrieved 3 March 2014. ^ Євромайдан Львів встановив кількісний рекорд. Lviv Expres (in Ukrainian). 1 December 2013. Archived from the original on 3 December 2013. Retrieved 1 December 2013. 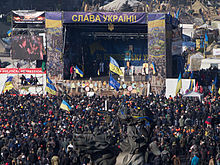 ^ "EuroMaidan rallies in Ukraine (Jan. 23 live updates)". Kyiv Post. 23 January 2014. Retrieved 24 January 2014. ^ Тернопільський Євромайдан зібрав більше 10 тисяч людей [Ternopil Eeuromaydan brought together more than 10 thousand people] (in Ukrainian). UA: TE. 8 December 2013. Retrieved 15 December 2013. ^ Мариинском парке собралось около 3–4 тысяч "титушек" – нардеп [Mariinsky park were about 3–4 thousand "titushek" – People's Deputy]. UNIAN (in Ukrainian). 22 January 2014. Retrieved 23 January 2014. ^ В Харькове провели масштабный провластный митинг. BBC (in Russian). 30 November 2013. Retrieved 30 November 2013. ^ "На провластный митинг в Донецке привезли несколько десятков автобусов "неравнодушных"". Gazeta.ua. 23 July 2013. Retrieved 4 December 2013. ^ Наша задача: отстаивать национальные интересы, строить Европу в Крыму и в Украине – Павел Бурлаков [Our task: to defend national interests, to build Europe in the Crimea and in Ukraine – Paul Boatmen]. Новости Крыма [Crimean News] (in Ukrainian). UkraineInfo. 4 December 2013. Archived from the original on 7 December 2013. Retrieved 4 December 2013. ^ ЄвромадаЇ в Україні: Запоріжжя вражало кількістю, а в Одесі пам'ятник Дюку "одягли" у прапор ЄС [YevromadaYi in Ukraine Zaporozhye striking number, and in Odessa Monument to Duke "dressed" in the EU flag] (in Ukrainian). UA: TSN. 24 November 2013. Retrieved 15 December 2013. ^ "Ukraine Health Ministry: Kyiv unrest death toll reaches 100". Kyiv Post. Archived from the original on 21 February 2014. Retrieved 6 March 2014. ^ a b МОЗ: З початку сутичок померло 28 людей. Ukrayinska Pravda (in Ukrainian). Archived from the original on 1 December 2008. Retrieved 20 February 2014. ^ a b c d e f g h i j k "Police advance on EuroMaidan at night after government ultimatum". Kyiv Post. 18 February 2014. Archived from the original on 19 February 2014. ^ "В полоні МВС: затримано 77 активістів, в'язниця загрожує 40 з них". Ukrayinska Pravda. Archived from the original on 20 February 2014. Retrieved 20 February 2014. ^ Dassanayake, Dion. "Ukraine protests: Death toll rises as police and protestors clash after truce collapses". Daily Express. Retrieved 12 March 2014. ^ "Police held hostage by protesters in Kiev: interior ministry". Chicago Tribune. 19 February 2014. Archived from the original on 23 February 2014. Retrieved 23 February 2014. ^ a b "Information about the victims of clashes in the center of Kyiv". Ministry of Healthcare. Archived from the original on 17 April 2014. Retrieved 16 April 2014. ^ "Ukraine Tries Ex-President Yanukovych In Absentia For Treason". RadioFreeEurope/RadioLiberty. Retrieved 2017-12-05. ^ Damien McElroy (23 February 2014). "Ukraine revolution: live – Ukraine's president has disappeared as world awakes to the aftermath of a revolution". The Daily Telegraph. Retrieved 10 May 2018. ^ "Frequently asked questions about Ukraine, the EU's Eastern Partnership and the EU-Ukraine Association Agreement" (PDF). European Union External Action. 24 April 2015. Retrieved 6 May 2015. ^ Thompson, Mark (12 March 2014). "Soros: Ukraine needs EU Marshall Plan". CNN Money. Archived from the original on 16 March 2014. Retrieved 24 March 2014. ^ 服部倫卓 (2014). “ウクライナのユーロマイダン革命”. ロシアNIS調査月報 2014年４月号: 86. ^ Kramer, Andrew (15 December 2013). "EU suspends trade deal talks with Ukraine". The Boston Globe. Archived from the original on 28 March 2014. Retrieved 27 March 2014. ^ a b "Ukraine crisis: Timeline". BBC News. 13 November 2014. Retrieved 10 May 2018. ^ Smith-Spark, Laura; Gumuchian, Marie-Louise; Magnay, Diana (23 January 2014). "Ukraine, Russia sign economic deal despite protests". CNN. Archived from the original on 28 March 2014. Retrieved 27 March 2014. ^ a b 服部倫卓 (2014). “ウクライナのユーロマイダン革命”. ロシアNIS調査月報 2014年４月号: 90. ^ Peter Leonard (27 March 2014). "IMF offers Ukraine up to $18 billion in loans". Yahoo! News. Archived from the original on 28 March 2014. Retrieved 1 April 2014. ^ "Lavrov: If West accepts coup-appointed Kiev govt, it must accept a Russian Crimea — RT News". RT TV network. 30 March 2014. Archived from the original on 6 May 2014. Retrieved 19 May 2014. ^ Sullivan, Tim (1 March 2014). "Russian troops take over Ukraine's Crimea region". Associated Press. Archived from the original on 1 March 2014. ^ Somini Sengupta (15 March 2014). "Russia Vetoes U.N. Resolution on Crimea". The New York Times. Retrieved 12 March 2015. ^ "Ukraine Violence Leaves at Least 10 Dead". ABC News. 18 February 2014. Archived from the original on 19 February 2014. Retrieved 18 February 2014. ^ a b "Ukraine police storm main Kiev protest camp". BBC News. 18 February 2014. Archived from the original on 1 December 2008. Retrieved 18 February 2014. 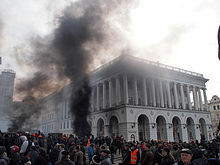 ^ a b c d e f g h i j k l "Four reported dead, more than 100 injured as violent clashes break out near Ukraine's parliament (live updates)". Kyiv Post. 18 February 2014. Archived from the original on 18 February 2014. ^ Matthews, Owen (19 February 2014). "Ukraine: Heading for Civil War". Newsweek. Archived from the original on 20 February 2014. Retrieved 20 February 2014. ^ Gianluca Mezzofiore. "Ukraine Facing Civil War: Lviv Declares Independence from Yanukovich Rule". International Business Times. Archived from the original on 1 December 2008. Retrieved 21 February 2014. ^ "The authorities de facto introduce a state of emergency". Ukrayinska Pravda. 18 February 2014. Archived from the original on 20 February 2014. ^ Рыбак заявил, что подписал постановление ВР о прекращении огня (in Russian). Ukrainian Independent Information Agency. 21 February 2014. Archived from the original on 21 February 2014. Retrieved 21 February 2014. ^ "Ukraine protests timeline". BBC News. 23 February 2014. ^ "Офіційний портал Верховної Ради України". W1.c1.rada.gov.ua. Retrieved 12 March 2014. ^ "Ukraine protests: Vitali Klitschko is seeking immediate resignation of President Yanukocych – watch live". The Daily Telegraph. 22 February 2014. Retrieved 22 February 2014. ^ Yuras Karmanau; Angela Charlton (22 February 2014). "Ukrainian protesters claim control over capital". Boston. Associated Press. Archived from the original on 28 February 2014. Retrieved 22 February 2014. ^ a b James Marson; Alan Cullison; Alexander Kolyandr (22 February 2014). "Parliament Ousts Ukraine President". The Wall Street Journal. Archived from the original on 22 February 2014. Retrieved 22 February 2014. ^ "Ukraine issues arrest warrant for missing leader". Washington Post. Associated Press. 24 February 2014. ^ Основные высказывания Виктора Януковича на пресс-конференции в Ростове-на-Дону [Basic statements of Viktor Yanukovych at a press conference in Rostov-on-Don] (in Russian). Russian News Agency "TASS". Archived from the original on 12 March 2014. Retrieved 12 March 2014. ^ a b "Putin to deploy Russian troops in Ukraine". BBC News. 1 March 2014. Archived from the original on 1 March 2014. Retrieved 1 March 2014. ^ a b "EU talking to IMF, World Bank, others about Ukraine assistance". Cnbc.com. 11 December 2013. Archived from the original on 2013-12-15. Retrieved 12 March 2014. ^ a b c "Ukraine leader seeks cash at Kremlin to fend off crisis". Cnbc.com. 17 December 2013. Retrieved 12 March 2014. ^ Vladmir Isachenkov and Maria Danilova (20 February 2014). "Roots and Consequence's of Ukraine's Violence". Associated Press. Archived from the original on 21 February 2014. Retrieved 20 February 2014. ^ a b c d "Law on amnesty of Ukrainian protesters to take effect on Feb 17". Interfax-Ukraine. 17 February 2014. Archived from the original on 21 February 2014. ^ a b "Yanukovych: I don't want to be at war, my goal is to restore stable development of country". Interfax-Ukraine. 15 February 2014. Archived from the original on 1 December 2008. ^ a b Fisher, Max (18 February 2014). "The three big reasons that protests reignited in Ukraine". The Washington Post. Retrieved 18 February 2014. ^ "Ukraine protests: 14 dead in worst day of violence". Australian Broadcasting Corporation. 19 February 2014. Retrieved 18 February 2014. ^ MacKinnon, Mark (22 February 2014). "How Putin's Sochi dream was shattered by Ukraine's nightmare". The Globe and Mail. ^ Matt Clinch. "EU moves toward Ukraine sanctions amid bloodshed". CNBC. Archived from the original on 1 December 2008. Retrieved 20 February 2014. ^ "Ukraine averted greater bloodbath, Moskal alleges". Kyiv Post. 24 February 2014. ^ "Arrest warrants issued for Yanukovych, other former Ukraine officials on suspicion of mass murder". Kyiv Post. 24 February 2014. ^ "Yanukovich planned harsh clampdown on protesters: Ukraine deputy". Reuters. Retrieved 23 October 2014. ^ a b "У кривавому побоїщі в Києві брала участь неукраїнська третя сила – Аваков". Ukrayinska Pravda. 4 March 2014. Retrieved 12 March 2014. ^ Mark Mackinnon. "Analysis: Russia blaming West for Ukraine upheaval". The Globe and Mail. Archived from the original on 22 February 2014. Retrieved 22 February 2014. ^ "Moscow urges crackdown in Ukraine on 'extremists' in government". Kyiv Post. 24 February 2014. Archived from the original on 24 February 2014. Retrieved 24 February 2014. ^ "Medvedev: Ukrainian authorities' legitimacy in doubt". Kyiv Post. 24 February 2014. Archived from the original on 24 February 2014. Retrieved 24 February 2014. ^ Olearchyk, Roman (3 April 2014). "Ukraine implicates Russian agents in deadly protester crackdown". Financial Times. ^ "Правый сектор объявил мобилизацию для мирного наступления'". Ukrayinska Pravda. Archived from the original on 22 February 2014. Retrieved 22 February 2014. ^ a b c d e f g h i j k l m n o p q r s t "Війна на вулицях Києва. ОНЛАЙН". Ukrayinska Pravda. 18 February 2014. Archived from the original on 21 February 2014. ^ "Мітингувальники прорвали оточення ВВ і намагаються розблокувати Грушевського" [Protesters broke through the cordon of Internal Troops and attempted to unblock Hrushevskoho]. Ukrayinska Pravda. 18 February 2014. Archived from the original on 21 February 2014. ^ "При захвате офиса Партии регионов убили двух сотрудников – Царев – Политика". 1+1 (テレビ局). Archived from the original on 21 February 2014. Retrieved 18 February 2014. ^ "Ukraine: protests at President Viktor Yanukovich's party HQ – video". The Guardian. 18 February 2014. Archived from the original on 22 February 2014. Retrieved 18 February 2014. ^ "Twitter / SpilnoTVEnglish: #Ukraine-#Berkut troops attack". Twitter. Retrieved 18 February 2014. ^ Max Seddon. "At Least 13 Dead, Dozens Injured As Ukraine Protests Turn Violent Again". Buzz Feed. Archived from the original on 20 February 2014. Retrieved 20 February 2014. ^ Москаль: Росіяни кажуть Януковичу, що його керівники СБУ та МВС профнепридатні (in Ukrainian). Espreso TV. 19 February 2014. Archived from the original on 21 February 2014. ^ "Protesters re-occupy Kiev city hall". New Straits Times. Agence France-Presse. 31 January 2014. Archived from the original on 21 February 2014. Retrieved 20 February 2014. ^ "Толпа в Киеве забила насмерть компьютерщика из Партии регионов" [The crowd in Kiev beat up the Party of Regions programmer to death]. Izvestia. Archived from the original on 21 February 2014. Retrieved 21 February 2014. ^ Тітушки знущаються на Антимайдані над полоненими активістами. Espreso TV. Archived from the original on 21 February 2014. Retrieved 19 February 2014. ^ T20:28+02:00 20:28 18 February 2014 (20 October 2012). "Неизвестные пытаются прорваться в консульство Канады в Киеве – милиция". Interfax-Ukraine. Archived from the original on 21 February 2014. Retrieved 18 February 2014. ^ "5 канал відключили по всій Україні". Ukrayinska Pravda. Archived from the original on 21 February 2014. Retrieved 19 February 2014. ^ На Майдане горит Дом профсоюзов [On Maidan Trade Unions building is burning]. Vestiua.com. Archived from the original on 21 February 2014. Retrieved 20 February 2014. ^ "Беркут" против Майдана ["Berkut" against Maidans]. Lenta.ru (in Russian). 18 February 2014. Archived from the original on 19 February 2014. Retrieved 19 February 2014. ^ Допис by Svyatoslav Tsegolko. "Янукович погрожує справами проти керівників опозиції – Яценюк" (in Ukrainian). Ukreayinska Pravda. Archived from the original on 21 February 2014. Retrieved 19 February 2014. ^ a b "Ukraine protesters resist police charge on Independence Square as death toll rises". Euronews. 19 February 2014. Archived from the original on 19 February 2014. ^ "Batkivschyna, UDAR, Svoboda never have and never will call people to armed protest". Interfax-Ukraine. 19 February 2014. Archived from the original on 21 February 2014. ^ a b "Three Ukrainian opposition forces calling to do everything possible to prevent further bloodshed". Interfax-Ukraine. 19 February 2014. Archived from the original on 21 February 2014. ^ a b "Kyiv on shutdown as Ukraine protesters fear new police crackdown". Euronews. 19 February 2014. Archived from the original on 19 February 2014. ^ "Ukrainian capital mostly normal beyond immediate protest zone". Euronews. 19 February 2014. ^ Тітушки Розстріляли Двох Протестувальників – Очевидці. Ukrayinska Pravda. Archived from the original on 21 February 2014. Retrieved 19 February 2014. ^ "Ukraine crisis: Renewed Kiev assault on protesters". BBC News. 19 February 2014. Archived from the original on 19 February 2014. Retrieved 19 February 2014. ^ a b c d e "EuroMaidan rallies in Ukraine (Feb. 19 live updates)". Kyiv Post. 19 February 2014. Archived from the original on 19 February 2014. ^ Оппозиция отказалась подписывать заявление об осуждении радикальных действий, – Лукаш (in Russian). Novosti.ua. Archived from the original on 21 February 2014. Retrieved 21 February 2014. ^ "Украина задолжала за "секретный" полет". 6 July 2015. Retrieved 8 July 2015. ^ "Euronews Kyiv correspondent: 'They say they are not going to provoke the police... but they know how to protect themselves'". Euronews. 19 February 2014. ^ Майдан нашел себе новый штаб – активисты заняли Главпочтамт. Nikvesti. Archived from the original on 21 February 2014. Retrieved 20 February 2014. ^ a b "Ukraine President Yanukovych sacks army chief amid crisis". BBC News. 19 February 2014. Archived from the original on 19 February 2014. ^ a b "Yanukovych accuses Ukraine opposition leaders of trying to seize power by force". Euronews. 19 February 2014. ^ Європейський інвестиційний банк заморожує діяльність в Україні - ЗМІ [European Investment Bank freezes activities in Ukraine - Media]. Epravda.com.ua. Archived from the original on 21 February 2014. Retrieved 20 February 2014. ^ "European Investment Bank freezes activities in Ukraine over violence". Reuters. Archived from the original on 21 February 2014. Retrieved 19 February 2014. ^ a b c "Ukraine president Viktor Yanukovych says truce reached with opposition figures". Daily Me. 19 February 2014. Archived from the original on 21 February 2014. ^ "Правий сектор" не погоджується на перемир'я ["Right Sector" does not agree to a truce]. The Insider (in Ukrainian). Archived from the original on 21 February 2014. Retrieved 20 February 2014. ^ "Protesters' defiance in Maidan: our correspondent's view". Euronews. 19 February 2014. ^ На Украине – день траура [In Ukraine - Day of Mourning]. Interfax. Archived from the original on 20 February 2014. Retrieved 20 February 2014. ^ "На Майдані з офіцера під час штурму зірвали шеврон із двоголовим орлом – Новини – Український тиждень". Tyzhden. Archived from the original on 26 February 2014. Retrieved 20 February 2014. ^ "На Майдані знову стріляють". Espreso TV. 20 November 2013. Archived from the original on 21 February 2014. Retrieved 20 February 2014. ^ "На Майдан приїхали активісти із Івано-Франківська" (in Ukrainian). Espreso TV. Archived from the original on 21 February 2014. Retrieved 20 February 2014. ^ a b c "Protesters take police hostages in conflict". Kyiv Post. 21 February 2014. ^ Gorchinskaya, Katya (13 March 2014). "Yakimenko accuses EuroMaidan leaders of hiring snipers; allegations denounced". Kyiv Post. Retrieved 13 March 2014. ^ a b c d e "'Dozens dead' in Kyiv as Ukraine 'truce' breaks down". Euronews. 20 February 2014. Archived from the original on 20 February 2014. ^ a b c d e f g "Ukraine death toll rising on Feb. 20 with at least 42 people killed, most by gunshots from police". Kyiv Post. 20 February 2014. Archived from the original on 21 February 2014. ^ "Ukraine protesters take back Kiev square". RTÉ News and Current Affairs. Archived from the original on 20 February 2014. Retrieved 20 February 2014. ^ a b "Captured Interior Troops soldiers released, their condition satisfactory – Interior Ministry". Interfax-Ukraine. 21 February 2014. Archived from the original on 1 December 2008. ^ ЗМІ: ВВшники масово здаються в полон активістам Євромайдану | Українська правда. Ukrayinska Pravda (in Ukrainian). Archived from the original on 21 February 2014. Retrieved 20 February 2014. ^ "There are more than 30 thousand people at Maidan". Ukrainian Independent Information Agency. 20 February 2014. Archived from the original on 21 February 2014. ^ Andrew Higgins; Andrew E. Kramer; Steven Erlanger (23 February 2014). "As His Fortunes Fell in Ukraine, a President Clung to Illusions". The New York Times. Retrieved 12 March 2015. ^ "Kyiv residents leave city center". Interfax-Ukraine. 20 February 2014. Archived from the original on 21 February 2014. ^ "Kyiv subway partially resumes operation, says press service". Interfax-Ukraine. 20 February 2014. Archived from the original on 21 February 2014. ^ "Велика Британія тимчасово закрила своє посольство в Києві" [UK temporarily closed its embassy in Kiev]. Ukrayinska Pravda. 20 February 2014. Archived from the original on 21 February 2014. ^ ВІДЕОФАКТ: силовики, втікаючи, стріляли з автоматів Калашникова (in Ukrainian). Radio Svoboda. 2014. Archived from the original on 21 February 2014. ^ "Ukrainian police have been provided with combat weapons – interior minister". Kyiv Post. Archived from the original on 21 February 2014. Retrieved 21 February 2014. ^ a b "Sniper fire brings disturbing new dimension to Ukraine violence". Euronews. 20 February 2014. ^ "Unknown people heading towards Ukrainian presidential administration building; shots audible". Interfax-Ukraine. 20 February 2014. Archived from the original on 21 February 2014. ^ a b c d e "Ukraine as it happened, Kyiv's bloodiest day". Euronews. 20 February 2014. Archived from the original on 20 February 2014. ^ "German, French, Polish foreign ministers end six-hour meeting with Yanukovych". Interfax-Ukraine. 20 February 2014. Archived from the original on 21 February 2014. ^ "EU demands elections in Ukraine – French foreign minister". Interfax-Ukraine. 20 February 2014. Archived from the original on 21 February 2014. ^ Ukrainian News Agency, Foreign Affairs Ministers Steinmeier Of Germany, Sikorski Of Poland, Fabius Of France To Meet With Yanukovych Again On Thursday-Friday Night. 23:08, Thursday, 20 February 2014. Archived 21 February 2014 at the Wayback Machine. ^ "Ukraine leader Yanukovych willing to hold early elections: Polish PM". Warsaw: Singapore Press. Agence France-Presse. 21 February 2014. Archived from the original on 1 December 2008. ^ Ruptly GmbH, Ukraine: European foreign ministers push Yanukovych to call election early. 17:36 (GMT), 20 February 2014; with video. ^ "Європа Погодила Санкції Проти Українських Чиновників". Ukrayinska Pravda. Archived from the original on 1 December 2008. Retrieved 20 February 2014. ^ "Council conclusions on Ukraine" (PDF). Council of the European Union. Archived (PDF) from the original on 1 December 2008. Retrieved 20 February 2014. ^ "Ukraine unrest: EU sanctions imposed". BBC News. 20 February 2014. Archived from the original on 1 December 2008. ^ "Scale of sanctions to depend on further developments in Ukraine- EU Council conclusions". Interfax-Ukraine. 20 February 2014. Archived from the original on 1 December 2008. ^ Єфремов поїхав до Луганська, щоб обдумати варіанти від'єднання Південного Сходу України, – ЗМІ (in Ukrainian). Espreso TV. 20 February 2014. Archived from the original on 20 February 2014. Retrieved 20 February 2014. ^ "Ukrainian 'love' split between 'motherland' and EU". Euronews. 20 February 2014. Archived from the original on 1 December 2008. ^ Anastasia Forina. "Serhiy Klyuyev condemns violence, but remains loyal to Yanukovych". Kyiv Post. Archived from the original on 1 December 2008. Retrieved 21 February 2014. ^ "У Рівному саморозпустилася обласна фракція Партії регіонів". The Insider. 20 February 2014. Archived from the original on 21 February 2014. Retrieved 20 February 2014. ^ a b c "Ten Regions Party MPs, two independent MPs express support for Ukrainian people". Interfax-Ukraine. 20 February 2014. Archived from the original on 1 December 2008. ^ "Emergency sitting of Verkhovna Rada opens". Ukrainian Independent Information Agency. 20 February 2014. Archived from the original on 1 December 2008. ^ "PR faction not to take part in today's sitting of Verkhovna Rada – Oleynyk". Ukrainian Independent Information Agency. 20 February 2014. Archived from the original on 1 December 2008. ^ "227 lawmakers registered in VR, sitting resumed". Ukrainian Independent Information Agency. 20 February 2014. Archived from the original on 1 December 2008. ^ "LIVE Ukraine unrest: Clashes in central Kiev". BBC News. 20 February 2014. Archived from the original on 1 December 2008. ^ "Members voted for ceasefire". Ukrayinska Pravda (in Ukrainian). 20 February 2014. Archived from the original on 21 February 2014. ^ Individual voting. Verkhovna Rada. 20 February 2014 Archived 2 March 2014 at the Wayback Machine. ^ a b "Rada condemns use of force causing deaths, bans counter-terrorism operations in Ukraine". Interfax-Ukraine. 20 February 2014. Archived from the original on 1 December 2008. ^ "Ukraine parliament holds debate despite Kyiv violence". Euronews. 20 February 2014. Archived from the original on 1 December 2008. ^ "Five more MPs left faction PR". Ukrayinska Pravda (in Ukrainian). 20 February 2014. Archived from the original on 21 February 2014. ^ Uainfo Blogosphere. "Бои в регионах: во Львове в казарме Беркута нашли два трупа". Big Mir. Archived from the original on 26 January 2014. Retrieved 21 February 2014. ^ Babiak, Mat. "Is Russia Opening a 'Crimean Front'?". Ukrainian Policy. Archived from the original on 1 December 2008. Retrieved 21 February 2014. ^ "Написав рапорт про звільнення Заступник начальника Генштабу". Ukrayinska Pravda. 21 February 2014. Archived from the original on 1 December 2008. ^ a b c d "EuroMaidan rallies in Ukraine". Kyiv Post. 21 February 2014. Archived from the original on 1 December 2008. ^ У Київ їдуть батальйон морських піхотинців і дві бригади десантників [To Kyiv are traveling a battalion of marines and two brigades of paratroopers] (in Ukrainian). LB. 21 February 2014. Archived from the original on 21 February 2014. ^ "До Києва стягують 1,5 тис. десантників і 400 морпіхів, – журналіст" [To Kyiv are being pulled 1.5 thousand paratroopers and 400 Marines – journalist]. LB. 20 February 2014. Archived from the original on 1 December 2008. ^ "Замість голосування в парламенті "регіонали" втікали зі столиці". Ukrayinska Pravda. 21 February 2014. Archived from the original on 1 December 2008. ^ "Пшонка і Захарченко тікають чартерами з України". Zik. 21 February 2014. Archived from the original on 21 February 2014. ^ "Police defectors welcomed to Independence Square in Kyiv". Euronews. 21 February 2014. Archived from the original on 1 December 2008. ^ "Ukraine's Security Service stops preparations for anti-terrorist operation". Interfax-Ukraine. 21 February 2014. Archived from the original on 1 December 2008. ^ "Opposition leaders sign deal with president to end crisis in Ukraine". Fox News Channel. 21 February 2014. Archived from the original on 1 December 2008. ^ "EU foreign ministers praise "risk -taking" Ukrainian protagonists". Euronews. 21 February 2014. Archived from the original on 1 December 2008. ^ "Agreement on the Settlement of Crisis in Ukraine - full text". The Guardian. 22 February 2014. Retrieved 12 March 2015. ^ "Agreement on the Settlement of Crisis in Ukraine" (PDF). Archived (PDF) from the original on 5 May 2014. Retrieved 21 February 2014. ^ "Ukraine: peace hopes in the air as president loses his powers". The Daily Telegraph. 21 February 2014. Archived from the original on 1 December 2008. ^ "Ukraine peace deal signed, opens way for early election". Reuters. 21 February 2014. Archived from the original on 1 December 2008. ^ "Представник РФ не мав мандату на підписання угоди про кризу – Клюєв | УКРІНФОРМ". Ukrinform.ua. 21 February 2014. Archived from the original on 12 March 2014. Retrieved 12 March 2014. ^ "Tensions high at Kyiv protest camp despite ground-breaking deal". CTV News. 21 February 2014. Archived from the original on 1 December 2008. ^ "Rada passes bill allowing Tymoshenko's releas". Interfax-Ukraine. 21 February 2014. Archived from the original on 1 December 2008. ^ "Парламент звільнив Тимошенко". Espreso TV. Archived from the original on 21 February 2014. Retrieved 22 February 2014. ^ "Rada passes bill allowing Tymoshenko's release". Interfax-Ukraine. 21 February 2014. Archived from the original on 1 December 2008. ^ "В Раду внесен законопроект об импичменте президенту". 21 February 2014. Archived from the original on 1 December 2008. ^ Парубій: дострокові вибори президента мають відбутися якнайшвидше. Ukrayinska Pravda (in Ukrainian). 21 February 2014. Archived from the original on 1 December 2008. ^ "Автомайдан: Не сприймаємо нічого, крім відставки Януковича". Ukrayinska Pravda. Archived from the original on 1 December 2008. Retrieved 22 February 2014. ^ "Кличко вибачився перед Майданом за те, що потис руку Януковичу". The Sports Network. Archived from the original on 1 December 2008. Retrieved 22 February 2014. ^ "Люди Поставили Ультиматум: Відставка Януковича До Ранку". Ukrayinska Pravda (in Ukrainian). Archived from the original on 1 December 2008. Retrieved 22 February 2014. ^ "У Київській області горить дача Медведчука". Ukrayinska Pravda (in Ukrainian). Archived from the original on 1 December 2008. Retrieved 22 February 2014. ^ Верховная Рада, Администрация президента, Кабмин и МВД перешли под контроль Майдана (in Russian). Ukrainian Independent Information Agency. Archived from the original on 1 December 2008. Retrieved 22 February 2014. ^ Babiak, Mat. "Coup on the Horizon". Ukrainian Policy. Archived from the original on 1 December 2008. Retrieved 22 February 2014. ^ "Group of 31 deputies who 'have their own opinion' formed in Regions Party faction – Tigipko". Interfax-Ukraine. 21 February 2014. Archived from the original on 1 December 2008. ^ "Rada prohibited the anti-terrorist operation". BBC of Ukraine. 20 February 2014. Archived from the original on 20 February 2014. ^ "ВІТАЛІЙ ЗАХАРЧЕНКО: "У ПОДІЯХ В КИЄВІ ВИННІ БЕЗВІДПОВІДАЛЬНІ ПОЛІТИКИ". MVS Ukraine. Archived from the original on 20 February 2014. Retrieved 19 February 2014. ^ "Координатор медичної служби Майдану: за сьогодні вбито від 70 людей". Ukrayinska Pravda. 20 February 2014. Archived from the original on 20 February 2014. Retrieved 20 February 2014. ^ У Сутичках у Києві убито від 67 до 100 людей [In Kyiv in clashes were killed 67 to 100 people]. Ukrayinska Pravda (in Ukrainian). 20 February 2014. Archived from the original on 20 February 2014. ^ Leaked call raises questions about who was behind sniper attacks in Ukraine, CNN, 6 March 2014. ^ Estonia denies leaked call implicates Ukraine protesters in killings, Reuters, 5 March 2014. ^ Ukraine crisis: March 5 as it happened, entry for 15.17, The Telegraph, 5 March 2014. ^ Eckel, Mike (8 March 2014). "Kiev snipers: Who was behind them?". Christian Science Monitor. Associated Press. Retrieved 10 March 2014. ^ "Daily Beast: Russian-Trained Snipers Killed Ukrainian Protesters". Newsmax. 31 March 2014. Archived from the original on 7 April 2014. Retrieved 4 April 2014. ^ "Exclusive: Photographs Expose Russian-Trained Killers in Kiev". The Daily Beast. 30 March 2014. Archived from the original on 4 April 2014. Retrieved 4 April 2014. ^ "Yanukovych declares Feb 22–23 days of mourning victims". Interfax-Ukraine. 21 February 2014. Archived from the original on 21 February 2014. ^ "РИБАК ПОДАВ ЗАЯВУ ПРО ВІДСТАВКУ". Ukrayinska Pravda. Retrieved 22 February 2014. ^ Захарченко пересек украино-белорусскую границу (in Russian). Glavcom. 22 February 2014. Archived from the original on 22 February 2014. ^ Sindelar, Daisy (23 February 2014). "Was Yanukovych's Ouster Constitutional?". Radio Free Europe/Radio Liberty. Retrieved 25 February 2014. ^ "Ukraine protests timeline". BBC News. 23 February 2014. Archived from the original on 19 February 2014. ^ "Turchinov elected as speaker of Ukrainian Parliament". Voice of Russia. 22 February 2014. Archived from the original on 23 February 2014. ^ "Ukraine parliament removes Yanukovich, who flees Kiev in "coup"". 14 February 2014. Archived from the original on 22 February 2014. ^ Пограничники отказались выпустить самолет Януковича из Донецка [Border guards refused to release Yanukovich's plane in Donetsk]. Zerkalo Nedeli. 22 February 2014. Archived from the original on 22 February 2014. ^ "Экс-глава МВД Захарченко пытался покинуть Украину" [Ex-Interior Minister Zaharchenko tried to leave Ukraine]. Zerkalo Nedeli. 22 February 2014. Archived from the original on 22 February 2014. ^ Янукович пытается сбежать из Севастополя на корабле, – депутат [Yanukovych is trying to escape from Sevastopol on the ship - MP]. Argumenty Nedeli. 24 February 2014. Archived from the original on 24 February 2014. Retrieved 24 February 2014. ^ Янукович тікає морем [Yanukovych fleeing by sea]. Ukrayinska Pravda (in Ukrainian). 22 February 2014. Retrieved 24 February 2014. ^ "Russia, its military helped Yanukovych leave Ukraine in 2014 - former security guard" (in English). Retrieved 2018-01-31. ^ "Avakov: Yanukovych put on wanted list". Kyiv Post. Interfax-Ukraine. 24 February 2014. Archived from the original on 24 February 2014. Retrieved 24 February 2014. ^ "Yanukovych declared wanted – Avakov". UNIAN. 24 February 2014. Archived from the original on 26 February 2014. ^ "Rada asks Hague court to punish those responsible for crimes against humanity during peaceful protests in Ukraine". Interfax-Ukraine. 25 February 2014. Archived from the original on 19 October 2014. Retrieved 25 February 2014. ^ "Yanukovych, Zakharchenko put on international wanted list, says prosecutor general". Interfax-Ukraine. 26 February 2014. Archived from the original on 19 October 2014. Retrieved 26 February 2014. ^ "Yanukovych, Kliuyev, Pshonka, Zakharchenko, Yakymenko, Shuliak face murder charges – PGO". Interfax-Ukraine. 26 February 2014. Archived from the original on 19 October 2014. Retrieved 26 February 2014. ^ Anastasia Vlasova. "Ukrainians celebrate EuroMaidan's triumph". Kyiv Post. Archived from the original on 23 February 2014. Retrieved 23 February 2014. ^ "Parliament appoints Avakov acting interior minister". Interfax-Ukraine. 22 February 2014. Archived from the original on 28 February 2014. ^ "Ukrainian parliament expresses no-confidence to Viktor Pshonka". Trend News Agency. 22 February 2014. Archived from the original on 27 December 2014. ^ "На Украине отменили закон о региональном статусе русского языка". Lenta.ru. Archived from the original on 23 February 2014. Retrieved 23 February 2014. ^ "Ukrainian parliament dismisses foreign, health and education ministers, authorizes speaker to act as president". Interfax-Ukraine. 24 February 2014. Archived from the original on 28 February 2014. ^ "Ukrainian parliament to appoint and dismiss judges". Interfax-Ukraine. 24 February 2014. Archived from the original on 28 February 2014. ^ "Верховная Рада продолжает увольнять людей Януковича". newdaynews.ru. 30 May 2005. Archived from the original on 28 February 2014. Retrieved 12 March 2014. ^ "Ukraine's parliament appoints new central bank chief". Reuters. 24 February 2014. Archived from the original on 28 February 2014. ^ "Ukrainian parliament appoints Nalyvaichenko as security service chief". Interfax-Ukraine. 24 February 2014. Archived from the original on 28 February 2014. ^ a b "Party of Regions faction becomes opposition". Kyiv Post. Interfax-Ukraine. 24 February 2014. Archived from the original on 1 March 2014. ^ "Government should be approved on Thursday – Turchynov". Interfax-Ukraine. 25 February 2014. Archived from the original on 1 March 2014. ^ "Ukraine seeks agreement on national unity government by Tuesday". Reuters. 23 February 2014. Archived from the original on 1 March 2014. ^ "Rada creates Group for Economic Development". Radio Ukraine. 25 February 2014. Archived from the original on 30 May 2014. ^ Депутатські фракції і групи VII скликання [Deputy fractions and Groups VII convocation] (in Ukrainian). Verkhovna Rada. Archived from the original on 20 September 2012. ^ "Turchynov assumes duties of supreme commander-in-chief of Ukrainian Armed Forces". Interfax-Ukraine. 26 February 2014. Archived from the original on 15 April 2014. ^ "Rada decides to release political prisoners, including Pavlychenko family". Interfax-Ukraine. 24 February 2014. Archived from the original on 28 February 2014. ^ "Rada dismisses Constitutional Court judges appointed from its quota, proposes acting president and congress of judges dismiss the rest". Interfax-Ukraine. 24 February 2014. Archived from the original on 28 February 2014. ^ "Address of judges of the Constitutional Court of Ukraine to European and international organisations and human rights institutions". Constitutional Court of Ukraine official web site. 27 February 2014. Archived from the original on 19 October 2014. Retrieved 20 March 2014. ^ "Yatseniuk, confirmed as prime minister, accuses Yanukovych administration robbing Ukraine of $70 billion; 'treasury is empty'". Kyiv Post. 27 February 2014. Archived from the original on 27 February 2014. ^ Ennis, Stephen (12 March 2014). "BBC News - Ukraine hits back at Russian TV onslaught". BBC News. Archived from the original on 29 May 2014. Retrieved 19 May 2014. ^ Oksana Grytsenko (27 February 2014). "Arseniy Yatseniuk nominated to lead new government as Ukraine prime minister". Kyiv Post. Archived from the original on 27 February 2014. ^ "Rada passes bill on government lustration in first reading". Interfax-Ukraine. 14 August 2014. Archived from the original on 14 August 2014. ^ Bsai Yang (12 August 2014). "Ukraine OKs Malaysian experts' access to MH17 crash site". China Central Television. Xinhua News Agency. Archived from the original on 13 August 2014. ^ "Ukraine could sack up to million officials with ties to Russian past". Yahoo News. 9 October 2014. ^ "Volodymyr Yavorsky: Proposed lustration law has serious defects". Kyiv Post. 14 August 2014. Archived from the original on 14 August 2014. ^ "SBU arrests deputy of ex-chief". Ukrainian Independent Information Agency. 10 November 2014. Archived from the original on 11 November 2014. ^ Tucker, Maxim (8 April 2015). "Mystery of Ukraine's Richest Man and a Series of Unlikely Suicides". Newsweek. Retrieved 11 April 2015. ^ Київське метро зупинило рух [Kiev subway stopped functioning]. Ukrayinska Pravda. 18 February 2014. Retrieved 13 March 2014. ^ "Макеєнко: Метро не працюватиме, доки у Києві не буде безпечно". Zik. 20 February 2014. Archived from the original on 27 February 2014. Retrieved 13 March 2014. ^ "У Києві припинило роботу метро". Ua.racurs.ua. 18 February 2014. Retrieved 13 March 2014. ^ "Макеєнко відмовився відновлювати роботу метрополітену". Pravda.com.ua. 20 February 2014. Retrieved 13 March 2014. ^ Роботу метро в Києві треба відновити негайно — колишній голова КМДА Archived 25 February 2014 at the Wayback Machine. ^ "Метрополітен перевозить "тітушок" з Позняків на Печерськ". Gazeta.lviv.ua. 20 February 2014. Archived from the original on 25 February 2014. Retrieved 13 March 2014. ^ （ウクライナ語） Kiev subway fully resumed, and in the street too, Ukrayinska Pravda (24 February 2014). ^ "Head of Ukrainian Interior Ministry signs order to dissolve "Berkut"". Voice of Russia. 25 February 2014. Archived from the original on 1 March 2014. ^ Gutterman, Steve (18 March 2014). "Putin signs Crimea treaty, will not seize other Ukraine regions". Reuters. Archived from the original on 29 March 2014. Retrieved 26 March 2014. ^ "Ukraine: Speaker Oleksandr Turchynov named interim president". BBC News. 23 February 2014. Archived from the original on 23 February 2014. ^ "Ukraine protests timeline". BBC News. 23 February 2014. Archived from the original on 23 February 2014. ^ Young, Cathy (21 May 2014). "Fascism Comes to Ukraine -- From Russia". Archived from the original on 21 May 2014. ^ "Общественный союз "Украинский фронт" 22 февраля проведет съезд депутатов юго-восточных областей страны". Kommersant.ru. 21 February 2014. Archived from the original on 22 February 2014. Retrieved 22 February 2014. ^ "Клюев заставляет губернаторов ехать в Харьков на сьезд за федерализацию —Главком". Glavcom. Archived from the original on 22 February 2014. Retrieved 22 February 2014. ^ Zaks, Dmitry (20 April 2011). "Militants threaten to shatter fragile Ukraine truce – Yahoo News". Yahoo! News. Archived from the original on 22 February 2014. Retrieved 22 February 2014. ^ ? Как к Вам обращаться? (5 February 2014). "Янукович с Клюевым и Рыбаком вылетели в Харьков". Gazeta.ua. Archived from the original on 22 February 2014. Retrieved 22 February 2014. ^ "Янукович прибыл в Харьков и может принять участие в съезде депутатов юго-восточных областей – источник". Interfax-Ukraine. 20 October 2012. Archived from the original on 22 February 2014. Retrieved 22 February 2014. ^ СБУ порушила кримінальні справи проти Добкіна і Кернеса – Луценко (in Ukrainian). Zik. Archived from the original on 22 February 2014. Retrieved 22 February 2014. ^ "Kharkiv mayor, governor flee Ukraine across border with Russia – acting interior ministry's spokesperson". Interfax-Ukraine. 22 February 2014. Archived from the original on 22 February 2014. ^ Депутаты на съезде в Харькове берут на себя полноту власти на Юго-востоке и в Крыму – резолюция (in Russian). Gazeta.ua. 22 February 2014. Archived from the original on 22 February 2014. ^ "Clashes in Ukraine". Radio Free Europe/Radio Liberty. 22 February 2014. Archived from the original on 22 February 2014. ^ Traynor, Ian (24 February 2014). "Western nations scramble to contain fallout from Ukraine crisis". The Guardian. Archived from the original on 23 February 2014. ^ Ayres, Sabra (28 February 2014). "Is it too late for Kiev to woo Russian-speaking Ukraine?". CSM. Archived from the original on 28 February 2014. ^ "Ukraine's parliament-appointed acting president says language law to stay effective". ITAR-TASS. 1 March 2014. Archived from the original on 12 August 2014. ^ Mark Mackinnon (23 February 2014). "Globe in Ukraine: Upheaval widens fractures between east and west". The Globe and Mail. Archived from the original on 16 March 2014. Retrieved 24 February 2014. ^ "Ukraine conflict: 'Raw anger' in divided Kharkiv". BBC News. 23 February 2014. Archived from the original on 25 February 2014. Retrieved 24 February 2014. ^ "Пам'ятник Леніну у Харкові демонтують у вівторок | УКРІНФОРМ". Ukrinform.ua. 21 August 2013. Archived from the original on 2 March 2014. Retrieved 24 February 2014. ^ "Oplot leader faces criminal charges". Interfax-Ukraine. 24 February 2014. Archived from the original on 28 February 2014. ^ Елена Захаренкова. На площади Свободы – митинг "патриотичных харьковчан". Objectiv.tv (in Russian). Archived from the original on 5 March 2014. Retrieved 12 March 2014. ^ "В Донецке пророссийские активисты штурмовали обладминистрацию". Zerkalo Nedeli. 7 March 2014. Archived from the original on 7 March 2014. Retrieved 12 March 2014. ^ Andrew Roth (3 March 2014). "From Russia, 'Tourists' Stir the Protests". The New York Times. Archived from the original on 4 March 2014. ^ "Why Ukraine is dialing back its military offensive in anarchic east (+video)". 29 April 2014. Retrieved 30 April 2014. ^ Babiak, Mat (19 April 2014). "Southeast Statistics". Kyiv International Institute of Sociology; Ukrainian Policy. Kiev. Archived from the original on 5 March 2014. Retrieved 20 April 2014. ^ "Ousted Ukrainian President Asked For Russian Troops, Envoy Says". NBC News. Reuters. 3 March 2014. Archived from the original on 22 March 2014. Retrieved 21 March 2014. ^ Radyuhin, Vladimir (1 March 2014). "Russian Parliament approves use of army in Ukraine". The Hindu. Chennai, India. Archived from the original on 5 July 2014. ^ Walker, Shaun (4 March 2014). "Russian takeover of Crimea will not descend into war, says Vladimir Putin". The Guardian. Archived from the original on 4 March 2014. Retrieved 4 March 2014. ^ Yoon, Sangwon; Krasnolutska, Daryna; Choursina, Kateryna (4 March 2014). "Russia Stays in Ukraine as Putin Channels Yanukovych Request". Bloomberg News. Archived from the original on 5 March 2014. Retrieved 5 March 2014. ^ "Ukraine: Russia Angry as Another Soviet Hero Statue Toppled". International Business Times. 25 February 2014. ^ "Ukrainian city demolishes monument to Russian general who beat Napoleon". 25 February 2014. ^ a b "First the president, now Lenin: Stunning map reveals 100 statues of Soviet leader have been toppled in Ukraine". Daily Mail. 25 February 2014. Archived from the original on 27 May 2014. Retrieved 25 May 2014. ^ "Right-wing opposition pulls down monument to Lenin in Ukraine's Zhitomir". ITAR-TASS. 21 February 2014. Retrieved 2018-05-11. ^ Во Львовской области демонтировали памятник советскому солдату (фото) [In the Lviv region the monument to Soviet soldier got dismantled (Photo)]. segodnya.ua (in Russian). 23 February 2014. Archived from the original on 1 March 2014. Retrieved 22 April 2014. ^ Демонтували пам'ятник "Солдату" (фото, відео) [Soviet soldier monument got dismantled (Photo, video)]. Stryi.com.ua (in Ukrainian). 15 May 2014. Archived from the original on 27 March 2014. Retrieved 19 May 2014. ^ "В Киеве "евромайданщики" осквернили братскую могилу рабочих "Арсенала" (фото) | Новости Одессы". Dumskaya.net. 9 December 2013. Retrieved 19 May 2014. ^ "В Днепропетровске осквернили памятники Славы, афганцам и генералу Пушкину". Komsomolskaya Pravda. 28 February 2014. Archived from the original on 6 May 2014. Retrieved 19 May 2014. ^ "Another Russophobic vandalism act took place in Lvov Region: monument to Russian army commander Kutuzov was pulled down. Stop this outrage". Twitter. 25 February 2014. Retrieved 25 February 2014. ^ "Ukraine protests 'spread' into Russia-influenced east". BBC News. 26 January 2014. Archived from the original on 27 January 2014. ^ "Ukraine agrees to 50% gas price hike amid IMF talks". BBC News. 26 March 2014. Archived from the original on 27 March 2014. Retrieved 26 March 2014. ^ "Dynamo to play Valencia in Cyprus". UEFA. 19 February 2014. Archived from the original on 27 February 2014. ^ "Soccer-Dynamo Kiev game against Valencia moved to Cyprus". Yahoo!. Reuters. 19 February 2014. Retrieved 19 February 2014. ^ "Officially. Match "Dynamo" – "Valencia" will be held in Cyprus". Ukrayinska Pravda. Champion. 19 February 2014. ^ "Dnipro, Spurs honor Ukraine protests victims". Boston Herald. 20 February 2014. Archived from the original on 20 February 2014. ^ "Viktoria vs Shakhtar: full house, player kit, respect". FC Shakhtar Donetsk. 20 February 2014. Archived from the original on 20 February 2014. ^ "Europa League: Valencia claim 2–0 win over Dynamo Kyiv in Cyprus". Sky Sports. 20 February 2014. Archived from the original on 20 February 2014. ^ "Частину матчів Чемпіонату України "Суперліга" перенесено". Superleague.ua. 25 February 2014. Archived from the original on 18 October 2014. Retrieved 12 March 2014. ^ "The basketball championship of Ukraine suspended". Rupaper.com. 25 February 2014. Archived from the original on 3 March 2014. Retrieved 12 March 2014. ^ "Початок весняної частини змагань перенесено". Fpl.ua. Archived from the original on 10 March 2014. Retrieved 12 March 2014. ^ Nate Scott, USA TODAY Sports (3 March 2014). "USA-Ukraine soccer friendly moved to Cyprus". USA Today. Retrieved 23 October 2014. ^ "Vladimir Putin faces tough challenge as Ukraine turmoil unravels Russian designs". The Financial Express. 25 February 2014.